Where you can practice exactly what you want, when you want, anytime, anywhere! Choose your length of practice-from 5 minutes to 90 minutes. Choose what you want practice when you want to pratice. A wide variety of practices to choose from so you are NEVER bored! Yoga practices from yin to hatha to safe flow styles and yoga with weights. Other practices like core, resistance training, weights, a unique appoach to cardio. No babysitter, no problem, you never have to leave home to get to class with me. And an instructor that listens, request a video! Where your home becomes your personal and private studio. The only online movement and fitness studio where you get monthly coaching, Q&A, and you the viewers get to decide what videos get uploaded; to get the most out of your practice, and get exactly what you want every single month. Get professional, inspiring, functionally-safe classes all in the comfort and privacy of your own home. No travel, no hassle, no sitters, no fuss. A fresh approach to movement--this is not your typical yoga or fitness studio. Do you love yoga, core fitness, Pilates, resistance training, and movement practices that tell you the how's and why's, not just the what's of each movement? Wouldn't you love to leave your mat feeling inspired, where not only your body has gotten a complete tune-up, but your mind as well? For less the cost of two yoga classes at a studio, get unlimited access to classes that fit your schedule, need, and interest that won't break the bank. Hope's Online Yoga & Functional Fitness Studio contains the best of Hope's signature classes available to you only through her online studio. Classes never released before and classes filmed from her live studio classes that you can enjoy over and over again at no extra cost to you each and every month. These classes range from guided meditations, to detailed core workouts, yoga practices with weights, stretching practices, flow style classes with a variety of class lengths allows you to find the perfect practices to fit your needs that very day. 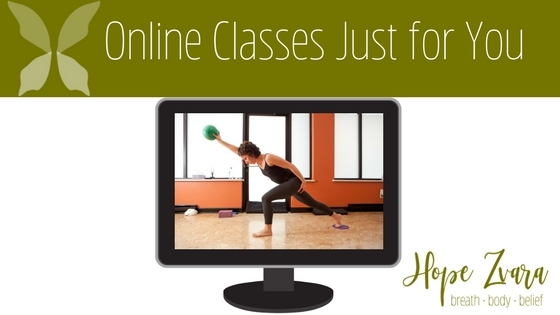 On the 15th of every month enjoy 4-6 NEW classes exclusively to Hope's online members. The ONLY studio of it's kind-Hope built this studio for her loyal students and followers, people looking for a better, safer way to practice on the mat. You the student get to control what kind of content is uploaded and viewed. With any mobile device or computer and wi-fi or internet access, you can stream Hope's best classes at the touch of a button. The Mindful Movement Matrix is the umbrella approach to how Hope helps people on the mat. A unique pulling from 15 years studying, teaching, and practicing yoga, functional movements, the core, meditation and breathing. This signature approach allows her to seamlessly teach all body's in one amazing class! For less the cost of two yoga classes at a studio you can enjoy unlimited yoga, and mindful movement based practices anytime, anywhere for just $9.99 a month. And can cancel at anytime. Foam Rolling Release Your Lower Body. Post-Travel Yoga for Back Care with Hope Zvara.